Ever asked the question, “How much is my horse worth?” You’re not alone! In the large and frequently changing online horse market, it’s hard to know the right price for your horse - and unfortunately, there are no easy answers. In fact, listings can range from free horses to steeds costing upwards of $100,000 – and sometimes far more for an elite show. However, most pleasure riders can find a good-natured, healthy trail horse for less than $5,000. Age: The prime age for a horse is between 7 and 14 years old. Horses much older than this are typically worth less, though the price will still depend on the horse’s condition and breeding. Plus, many horses are capable of doing hard work well into their 20s, so don’t rule out an older horse. Breeding: Bloodlines play a large role in horse prices, especially for breeds such as Quarter Horses, Paints and most Warmbloods. If your horse is by a top stallion, he could be worth significantly more than his breed and training would otherwise indicate. Training: If you plan to show your horse or want him to be trained in a specific discipline, expect price to depend on the breadth and depth of training the horse has received. Having a well-known trainer work with a horse also increases the price. Health problems and defects: Although you’ll want to be cautious when purchasing a horse with known health issues or injuries, a horse with minor problems may still be perfectly suitable for trail riding and recreational use - and may come at a significantly reduced price. 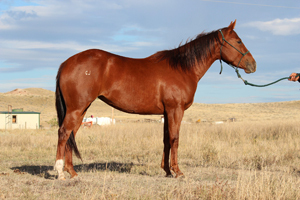 It is recommended that you have the horse examined by a veterinarian before the sale is final. Competition experience: The price of your horse will increase if he has logged some time in the show ring. Expect the price to rise even more for any equine that’s a proven winner. Reason for sale: If an owner is in a hurry to sell - often due to life or family changes like moving, pregnancy or divorce - you can expect lower horse prices or more bargaining room. However, sellers who don’t mind waiting for the right buyer are likely to have a firm price. Finally, remember that no matter how much you spend on a horse, chances are you’ll get what you pay for. So do your share of research before you buy, and know in advance what type of prices you can expect to pay to get the horse you want.. It is important, too, to create a budget for keeping your horse once you’re bought him. Following the tips in this horse price guide will not only keep you from making a poor decision, but will also prevent you from falling in love with the wrong horse. Ready to get started? Visit Equine.com and find yourself the perfect horse, or place a horse classified ad today.